LOS ANGELES - Feb. 10, 2017 - PRLog -- L.A. Wolves FC today announced that Eric Wynalda will take over as Head Coach with the club's first team, effective immediately. 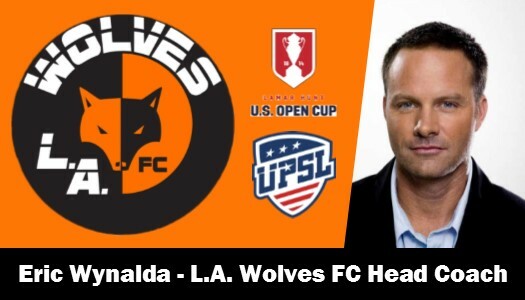 Wynalda has already begun training the squad as L.A. Wolves FC prepares for the 2017 United Premier Soccer League (UPSL) season and its upcoming Lamar Hunt U.S. Open Cup fixtures in April. L.A. Wolves FC Head Coach Eric Wynalda said, "The decision to return to coaching wasn't one that I made quickly, so it was a matter of finding the right opportunity at the right time. L.A. Wolves FC is a club on the rise. It has the right kind of leadership at the top, and creates nothing but opportunities for players looking to find a way to climb up the ladder. The club has all the hallmarks of future success, and with a shot to make a deep run in the Lamar Hunt U.S. Open Cup in 2017, the trajectory for L.A. Wolves FC is through the roof right now. There's much to do, and believe me, the work has already begun." L.A. Wolves FC Sporting Director Michael Collins said, "This is a very positive step for our club. L.A. Wolves FC is an organization committed to winning, and we think that bringing in Eric now as Head Coach will have an immediate impact as we prepare for the 2017 Lamar Hunt U.S. Open Cup Rounds that are just around the corner. As many folks know, Eric was a world-class striker and has played the game at the highest levels between the U.S. National Team and a solid stint in one of the world's most elite leagues, the German Bundesliga. Eric's knowledge and background as a successful player give him a resume we highly respect and feel players can connect with. As a coach, Eric has had some very good success in a brief but effective career starting with Cal FC in 2012 -- and his unprecedented U.S. Open Cup run leading the amateur side in a historic win over MLS's Portland Timbers in the 4th Round -- and leading NASL's Atlanta Silverbacks in 2012 and '14. We look forward to a long-term relationship with Eric as he gets to work with his vision in molding a squad that has had a winning record the past three years and is on the cusp on even greater things in the future." Wynalda, 47, is a retired American soccer player and current sports broadcaster for Fox Sports and SiriusXM Satellite Radio. Born in Fullerton (Calif.), Wynalda (pronounced Wuh-nall-dah) scored more than 60 goals in nearly 20 professional seasons in Germany and North America. He also scored a then-record 34 goals and had 106 caps for the United States Men's National Team. Wynalda grew up in Westlake Village (Calif.), and was a three-time all-California Interscholastic Federation selection at Westlake High School. He attended San Diego State University from 1987-'89, scoring 34 goals with 25 assists in the three collegiate seasons. Wynalda went on to score the first ever goal in Major League Soccer in 1996, and was the all-time leading goal scorer for the USMNT until 2008. Following his playing career, Wynalda led Cal FC (USASA) to a historic victory over Portland Timbers (MLS) in 2012, and had memorable stays as head coach of Atlanta Silverbacks (NASL) in '12 and '14. L.A. Wolves FC are a charter member for the UPSL (United Premier Soccer League) and compete in the Western Division, posting an 16-0-0 record for the 2016 Fall Season. The club also manages a reserve squad and oversees L.A. Wolves FC Youth Soccer Program.